Coinciding with the Commonwealth Heads of Government Meeting in Australia , 4000 people attended the End Polio Concert in Perth on Friday evening, October 28th raising their voices high to support the eradication of polio and calling on world leaders to commit financially to the effort. This is a tribute to the long-term and ongoing efforts of Rotarians around the world and the hard work of the Global Poverty Project. Listen to the video and pass along this important story of the power we all have to make a difference! Friends, Family and Followers – I’d like to ask if you could do something important on Monday, October 24th, World Polio Day. The first is to watch this video by actor, Hugh Jackman talking about polio. Then re-post or retweet the information below. Thank you for your support to END POLIO NOW. And now the explanation: October 24th is World Polio Day and a time for each of us to take some action to move us closer to eradication of this dread disease. Not known in the United State for many years, I still meet people with relatives that had polio – some are still alive and in wheelchairs or with post polio syndrome. And in the rest of the world there are still four countries endemic with the wild polio virus and re-transmissions in several other countries. Until polio is wiped out forever all polio-free countries stand the chance of re-transmission. Also think about the astronomical health costs to remain polio-free. A crippling and potentially fatal infectious disease, polio (poliomyelitis) still strikes children mainly under the age of five in countries in Asia, Africa, and the Middle East. Polio can cause paralysis and sometimes death. Because there is no cure for polio, the best protection is prevention. For as little as US$0.60 worth of vaccine, a child can be protected against this crippling disease for life. It can cause paralysis within hours, and polio paralysis is almost always irreversible. In the most severe cases, polio attacks the motor neurons of the brain stem, causing breathing difficulty or even death. Historically, polio has been the world’s greatest cause of disability. If polio isn’t eradicated, the world will continue to live under the threat of the disease. More than 10 million children will be paralyzed in the next 40 years if the world fails to capitalize on its US$5 billion global investment in eradication. The wild poliovirus (types 1 and 3) is endemic in only four countries: Afghanistan, India, Nigeria, and Pakistan. Nigeria has maintained a 95 percent drop in polio cases in the past 24 months. There has only been one case of polio in India since the beginning of this year. Even though the number of cases in Pakistan has increased by 70 percent in 2011 compared to last year, only one case of type 3 polio has been reported. Now let others know what you’ve learned about polio. Check out these websites for even more information: Gates Polio Challenge, Global Polio Initiative and the Global Poverty Project. I’ve signed the petition found on the Global Poverty Project’s site because I feel it is very important that ALL governments of the world take part financially in the eradication of polio. The four endemic countries are not only committed financially but also doing everything possible to get polio vaccine safely to all areas of their countries, even those in remote mountainous terrain. If you can, support a Rotary club fundraiser where the money goes to polio eradication or go to Rotary International and give. Rotary International has a Four Star ranking at Charity Navigator. A few days after Tropical Storm Irene tore through Schoharie County in New York, the Hats For A Purpose team jumped into action. Stepping forward, Donna, her sister, Kathy in Canada, Betty, a member of the Red Hats and my friend Cyndi, got right to work. 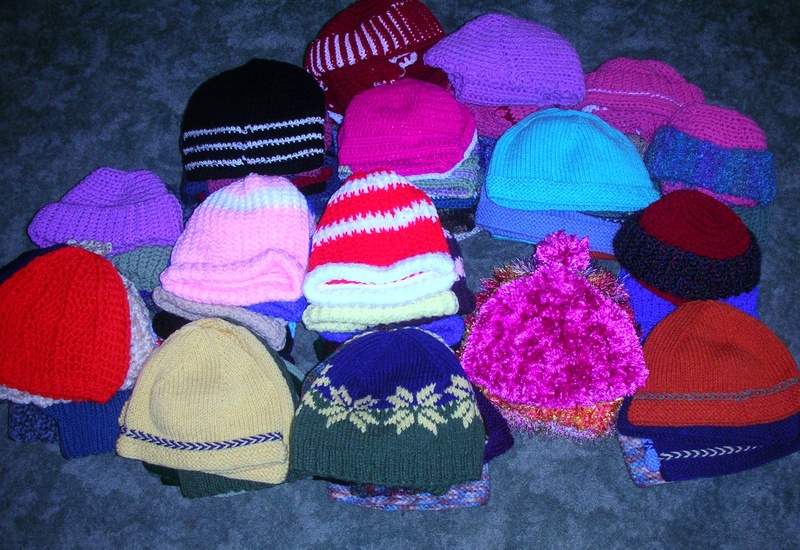 Tomorrow almost 100 exquisitely knit, crocheted or loomed hats, many with scarves to match, go to children in the Schoharie area just in time for our cold northeast winter days. 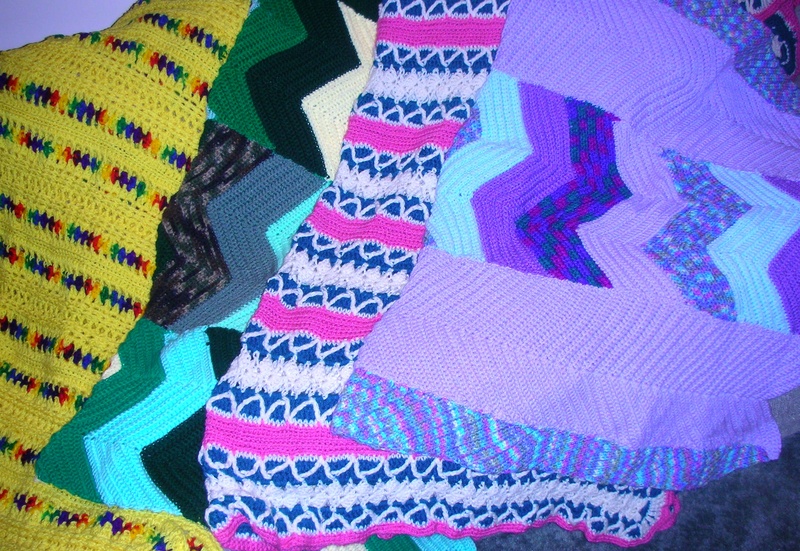 As an added bonus, Donna also made several beautiful afghans to help those that lost bedding and blankets. I know the recipients of these wonderful gifts will be appreciative. I also believe the deep, rich feeling of kindness and loving care is even more valuable. Thanks to a wonderful group of people. Hats off to you all! Most of you know that I write about people and organizations making a difference in the world; generally causes or projects and activities. But every once in a while I meet someone whose joy in her business and personal life also serves a noble purpose. Soap maker, Sue Kerber, is one of these people. She is the founder and owner of RAD Soap, LLC, a home based, locally owned business involving the entire family. Sue found a niche for her products that includes e-commerce, farmer’s markets and festivals to deliver what she says is “the best soap ever made.” Here’s how she combined family, a wish to use natural products, a zest for life and one really good sense of humor. Sue had a good career in sales for a business solutions company but when her children had various medical needs she found little in the way of natural healing products. So she started researching how to make salves and skin creams that might help with cuts and bruises, sore muscles, skin problems. Experimenting with essential and natural oils, organic fruit and herbal infusions, she made lotions, creams and soaps that are the basis of RAD today. Fast forward a few years, with a growing children and a desire to follow her dream, she and her family started RAD Soap. This is really a family business – everyone pitches in – they all use the products, make the soaps and creams, name them, create tags and wrappers, maintain the website and online ordering and every other detail that goes into a family owned business. Her son sold me my first bar of Score soap last year and amazed me with his knowledge of soap making and with his love for this product originally made for his sports aches and pains. Once you visit the RAD Soap website you will see what I mean about a good sense of humor. I love the pictures, the names of the products, how they are made and how much fun this family has working together……..a really noble purpose.